Watch Us Rise is a tender story about friendship, feminism, and activism. It is absolutely something to get the teens in your life who want to make a difference and find their voice. Jasmine and Chelsea are sick of the way women are treated even at their progressive NYC high school, so they decide to start a Women’s Rights Club. They post everything online—poems, essays, videos of Chelsea performing her poetry, and Jasmine’s response to the racial macroaggressions she experiences—and soon they go viral. But with such positive support, the club is also targeted by online trolls. When things escalate, the principal shuts the club down. Jasmine and Chelsea will risk everything for their voices—and those of other young women—to be heard. Watch Us Rise is a book that speaks inspiration. 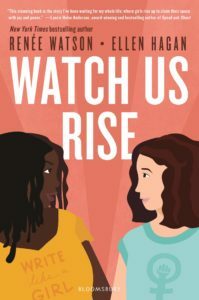 Whether it be the poems about microaggressions, or the ways their voices are suppressed, Watch Us Rise is a book to give to all the young teens in your life. It is a book about friendship, keeping each other accountable, and checking our privilege. At the same time it’s a story about loss, online trolls, and activism. In Watch Us Rise I absolutely love the two main characters because through these two lives we are able to witness all of these varying nuanced conversation. Jasmine is a fat black teen who is coming to terms with her dad’s cancer diagnosis. Whereas Chelsea is an outspoken feminist in a family that she feels doesn’t support her as much as she’d like. While there are certainly experiences and passions that unite these two, there are also issues that they cannot comprehend. Like the sadness Jasmine feels when she shops with Chelsea. And while Chelsea has no problem speaking up, and sometimes putting her foot in her mouth, Jasmine’s ethnicity means that even the things they experience together, are different for her. And it’s also a story about friendship, our two main character’s relationships with Nadine, biracial Japanese-Lebanese, and Isaac their two best friends. They are their foundation, a close knit group of teens united by memories and passion. But even though they attend a high school that encourages social activism, what they find out is that their school will only go so far. Whether it be their inability to confront sexual harassment, or to update the curriculum, this entire group of friends realizes that it is up to them to speak up. Watch Us Rise is an insightful book of nuanced conversations. It is a book about intersectionality, about realizing that the voices of teens matter, and that one person can make a difference. Because of these reasons, it’s exactly the book teens have to read about because while there are intense issues of sexual harassment and grief, these are precisely the issues with which teens are struggling. This book also celebrates making apologies, changing our mind about our ideas, and activism with intention. Find Watch Us Rise on Goodreads, Amazon, Indiebound & The Book Depository. What is your favorite co-authored book?